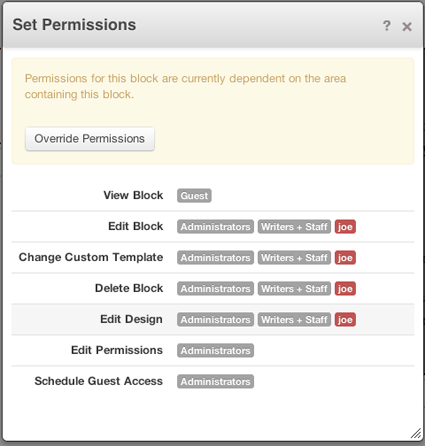 You can use advanced permissions to restrict what blocks can be added to individual areas and further refine those permissions by group. For example, if you have a header area that should only ever have an image slider in it, you can easily set the permissions on that area so that the Editors group can only add the image slider block and no other block types. Perhaps you want Administrators to have the ability to make an exception and add any block type-- that's easy too. 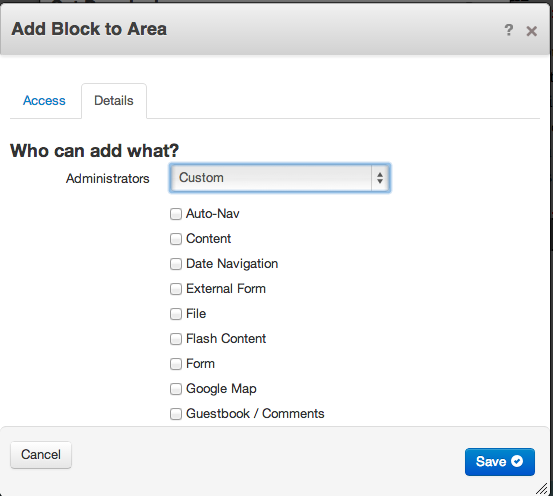 Advanced permissions lets you define what blocks each group on your site can add. Click on the page area you want to restrict (do this on the page in edit mode or on the page type default if you want it applied to all pages of that page type) and choose Set Permissions. Override the current permissions and choose Add Blocks to Area. Then there's a Detail tab where you can, by user group, define custom permissions for what blocks can be added to that area (so if Administrators need to be able to add any block but Editors and Authors can only add a specific block, you can define that level of complexity as well). In addition to the powerful options added to page permissions, Advanced Permissions also adds permissions controls on individual Areas, Blocks and Files in your site. By default, area and block permissions are inherited from the page's permissions. This can be overridden by putting the page in edit mode, clicking a specific block or area and editing permissions. You'll notice that the access entity and timed permissions interfaces are very similar to those in Page Permissions. Permissions may be set for content areas in each page. 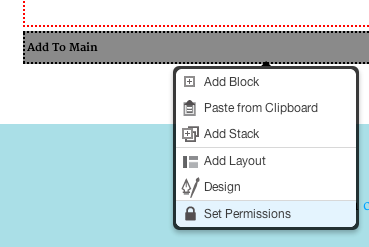 These permissions include viewing the area, adding blocks and stacks, editing the design, layouts, and deleting content. To set area permissions, click the Add to box below the area and choose Set Permissions. 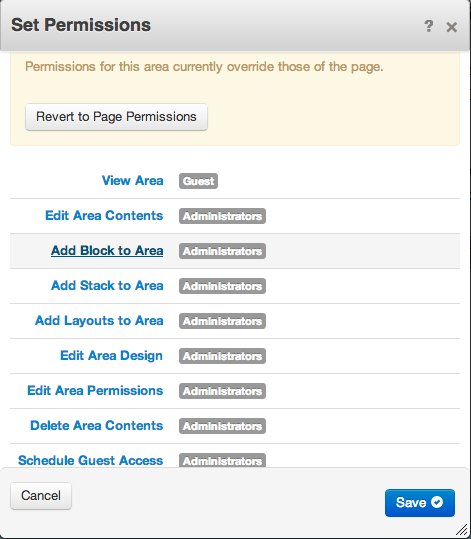 The interface for managing area permissions is the same as the page permissions interface. Block permissions function very similar to area permissions, but include permissions such as viewing, editing, changing the template, deleting, and design. To set block permissions, click the block and choose Set Permissions. As with area permissions, the interface for managing block permissions is the same as the page permissions interface. 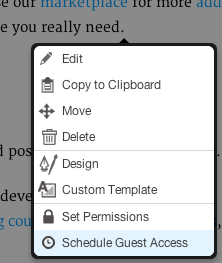 Advanced Permissions includes a feature to schedule guest access for a particular block. This can effectively show or hide a block to users in the "Guest" group-- which includes unregistered anonymous visitors to your site. 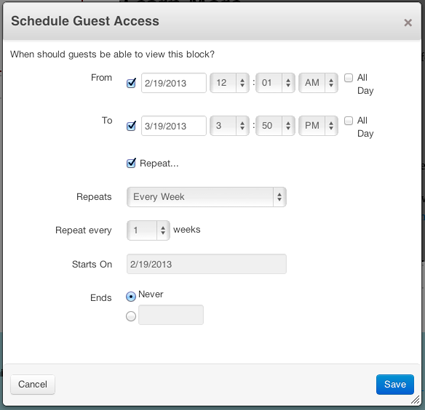 To use this feature, click on the block, select Schedule Guest Access, and then specify a time range in which guests should be able to view the block. 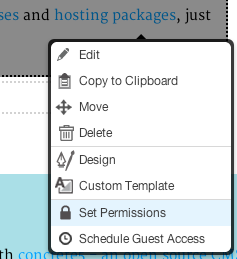 The interface for Schedule Guest Access is similar to the interface for setting timed permissions on pages. 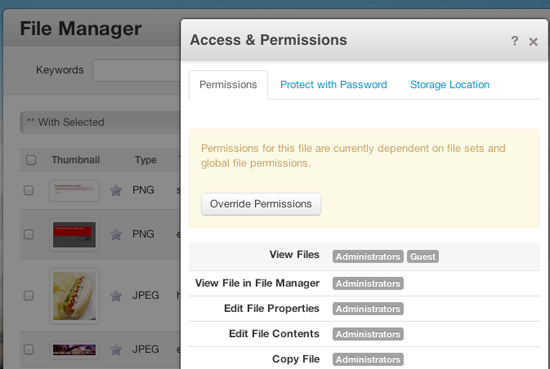 Advanced Permissions will also change the options available for file permissions. Each new file added will at first be governed by permissions on global file permissions and permissions for any File Sets it belongs to. This can be overridden for individual files.